In 20-sim, creating models only takes you just a few mouse clicks. By dragging an element from the library and dropping it in the graphical editor, your model is actually built the same way as you would draw an engineering scheme. 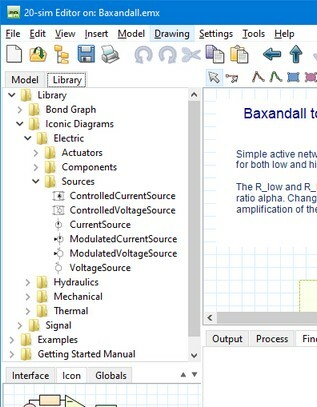 20-sim supports various model representations, such as block diagrams and iconic diagrams. These representations may be combined in one model. You can find the library at the left of the Editor. • Getting Started: al the models that you need in the lessons of the Getting Started manual. 1. From the Tools menu click Options - Folders - Library Folders. 3. Give it a useful name by clicking Edit Label. 4. Click OK to close the dialog. 1. Select the submodel that you want to store in your library. 2. From the File menu select Save Submodel. 3. Store the submodel in your library folder. The next time you start up 20-sim, the library will show the new submodel.